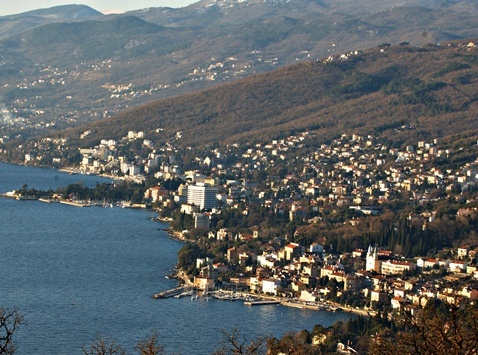 City of Opatija is located at the foot of majestic green slopes of the mountain Ucka (Učka). Opatija is a pristine coastal city, the cradle of tourism, culture and art of historical nations who have left the legacy of beautiful villas, cottages, promenades and parks. Were she a person, she would be a real lady, romantic, gentle and inspiring. The city is the centre of the eastern Istrian coast, but also of the western Kvarner Riviera, which stretches from Jablanac to Brsec (Brseč). Indented coastline is surrounded by the bay of Kvarner, many small islands, reefs, beaches, bays and ports, and is protect by the islands of Krk and Cres. Beaches are made of concrete, rock and gravel, reaching into the pure, blue sea and mysterious underwater life. The north is protected by the Mount Ucka (Učka) and its dense wooded areas that reach the coast. City, on the edge of the Mediterranean's notch into Europe, has a 160 years old tradition in tourism, the tradition of fishing. It used to be the residence of the nobles and kings in the unique setting of palm trees and camellias.